I’m the founder of LD4all.com, a website and community about lucid dreaming. 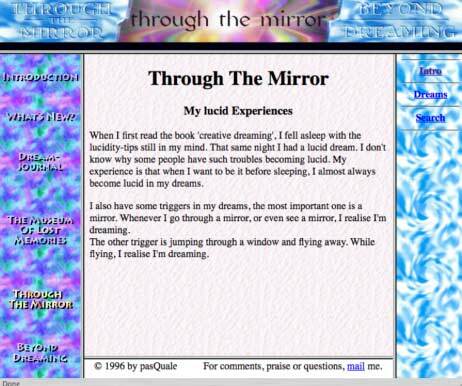 Since the beginning, now 14 years ago, I have always used my lucid dreams as guidance and inspiration for the look of the website. In this article I want to share with you two of the lucid dreams I have had which have profoundly influenced the graphics and layout of the website. In the early beginnings (the year 1996), LD4all wasn’t called LD4all yet. It was called:”Through the Mirror - Beyond Dreaming” and it was my graduation project for Art School. In those days, Internet was something new - so as a student in New Media I naturally felt drawn to the new medium. I decided to make a website about lucid dreaming. At that time, I had just discovered lucid dreaming myself, from reading the book “Creative Dreaming” by Patricia Garfield. I was so excited about it, that I wanted to share this amazing ability with the world. And what better way to do it than a website. I started building the website, but I wasn’t satisfied with how it turned out. I had created the layout you see above, and from then on, the only thing that needed to be done was to basically fill in all the pages with textual content. The site was boring. I got stuck. I didn’t want to continue like that, but I also didn’t know how to break out of my “designer’s block”. 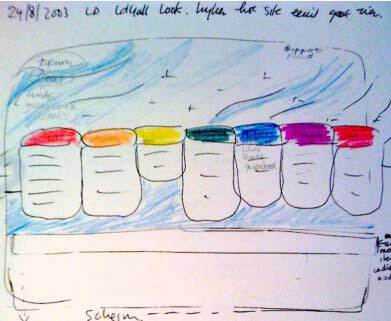 I decided to become lucid in a dream and search for the design of my project. I hoped to see something in my dream that would inspire me. That night, I became lucid. I'm lucid and I’m standing in a hallway with doors on both sides. I remember wanting to dream of my project. So I say to myself: "Behind this door I will see what my project will look like." I open the door, step inside and there on a table sits a computer. I look at the screen and there I see what my project looks like. When I woke up, I immediately sketched what I remembered. I had seen, very clearly, the screen divided into two equal parts, with on one part images, and the other part text. Also, thick black lines bordering the text. It was as if that lucid dream had uncorked a bottle of new inspiration. I now suddenly knew how to go forward with the website. It meant a drastic turn from the way it had been looking before that. Below is a screenshot of one of the pages of the final design. After I graduated, “Through the Mirror” stayed online, and grew. After a few years, I wanted my own domainname. “throughthemirror.com” or something similar didn’t have a ring to it so I had decided on a new name: LD4all.com. I really wanted a new look for my newly named website. 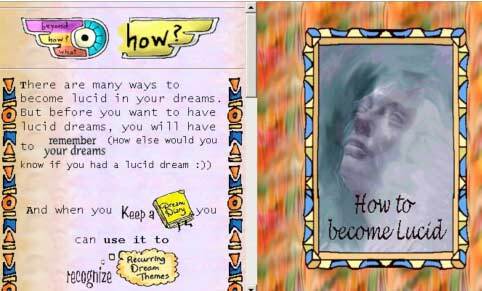 Once again, I decided to incubate a lucid dream to look for the design of the new LD4all. 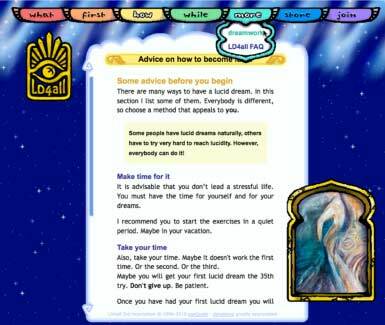 When I became lucid, I asked the dream to show me the new design for LD4all. The dream immediately responded. At first, I saw a huge golden logo, rotating in a starry sky. After the logo was shown, I saw an image of the layout of the website.When I woke up, I sketched all I could remember. This is the sketch of the layout. The layout showed an aurora in the top, colored drop down menu items, and a light blueish color. The drop down menu items were an element I had already pondered on in waking life. A new element brought by the dream was the “aurora” in the starry background sky. These elements I still remembered when waking up, but it was very difficult to recreate a website layout that matched it. The final design you see below. This design is still online and is now called "The guide". So, in this example, the inspiration from the dream wasn’t a complete turnaround from the way I had already been designing in waking life. The dream did give me some nice new ideas, like the aurora. The story of the LD4all logo is different. Before my lucid dream, I had already been working on the design of the logo, but no sketch I had made up to then really “hit the mark” so to speak. Yet, I didn’t really think of specifically looking for a logo in my dream, I just wanted to see “the design”. My lucid dream had presented me with the perfect logo. This was beyond any guidelines for design I had previously experienced in a lucid dream. The image of the huge golden logo, rotating in the starry sky stayed there for what seemed a long time, so I could really take in all details of it. But eventhough I knew exactly how it had to look, it was quite an effort to get it right. I had remembered the important elements: the way the “beams” had to go over the surrounding border and the way the “eye” was connected to the borders. You have seen how I have used my lucid dreams as guidance for the design of my website. When I use my lucid dreams for inspiration, I always am surprised what the dream shows me. Even when I have sketched and drawn and thought about the design, the dream still comes up with something entirely different than I already have thought of when awake. So if you ever have something you need inspiration for, why not use your lucid dreams for it? Call forth your project in your lucid dream and take a good look at it. Your dream could take you in new directions! Truly inspirational, and thank you for making such a wonderful website. It's so nice to see such an inspiration story up as a full-fledged article many thanks for this, and of course, for having created and maintaining LD4all as the fantastic LD community it was, and still is. I am studying graphic design, so I am always interested in the design process behind logos and other graphic design projects. Thank you for posting, I will be sure to use lucid dreams for my graphic design projects. Current LD goal(s): Increase lucid dream vividness.